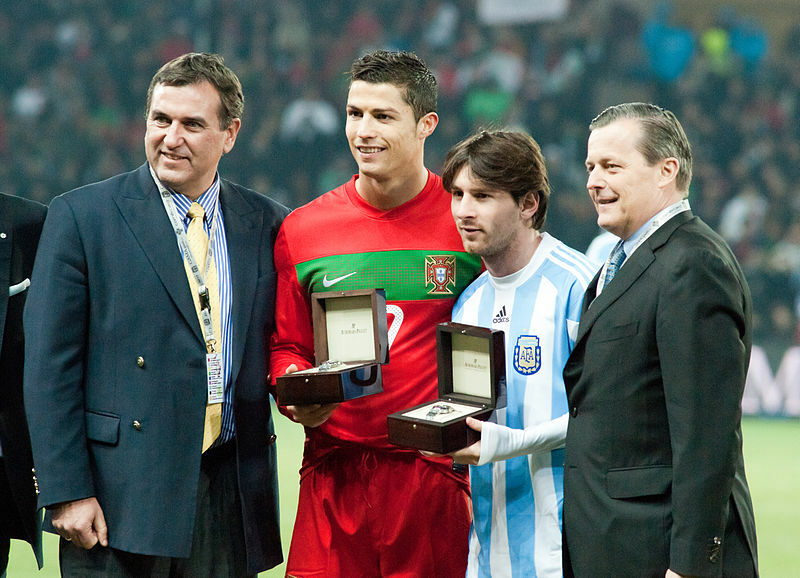 This week on 2 Guys and a Mike, Tyrrell Meertins and Hugo V breakdown World Cup qualifying playoffs, Ballon d’Or and they touch on Southampton and David Moyes. 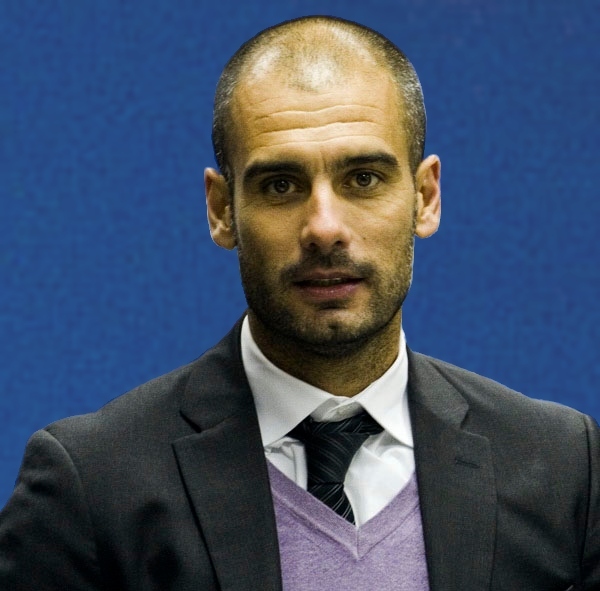 It was refreshing to see Pep Guardiola smiling in his Bundesliga debut, after a 15-month hiatus from the touchline. The Spaniard was filled with hand gestures, confidence and a load of emotion, as he earned his first competitive win as Bayern manager. Guardiola’s starting line up contained 10 players that started in last season’s Champions League final, with Toni Kroos being the only exception as he was unavailable due to injury. It’s normal to see Guardiola sticking with the same crop of players that were successful last season, as a major upheaval would only cause further set back for the Spaniard. The Bavarians kicked of the season in fine fashion, taking a two-goal lead in the opening 16 minutes. But all the Guardiola critics proclaiming that the Spaniard’s side is no different to Heynckes’ treble winners would be slightly incorrect. 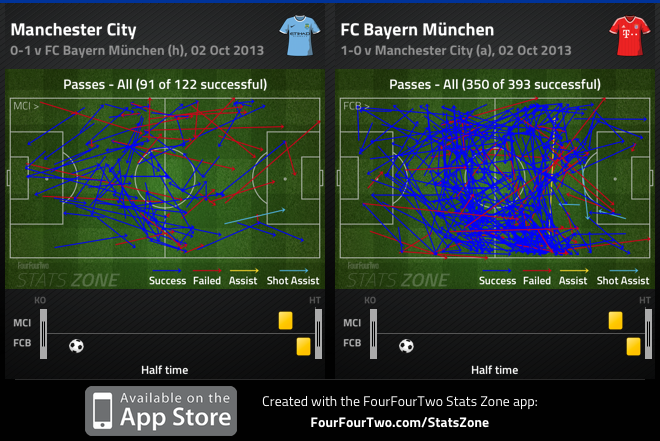 Guardiola’s 4-1-4-1 has been interesting to assess, but it’s slowly coming to fruition. Robben and Ribery have continued to dazzle on the flanks, and are eager to take players on – but they’ve also been encouraged to overload flanks to isolate their opposing fullbacks. 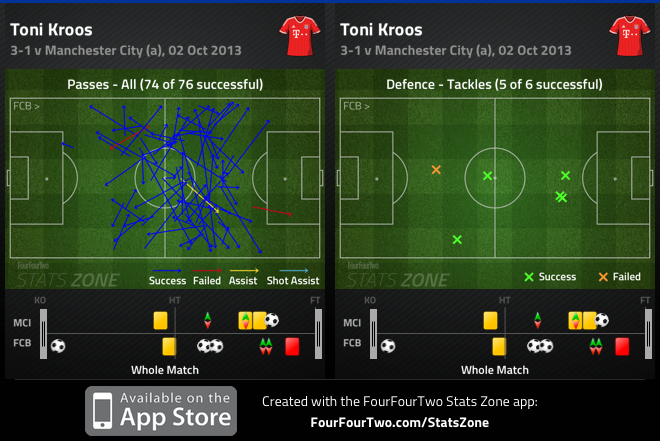 Kroos continues to play a pivotal role in the side, often drifting from flank to flank to link play with the wide men. What’s special about Kroos, besides his reliable passing in the final third, is his ability to find space to receive the ball, providing another passing option when teams press Bastian Schweinsteiger. Muller also displayed improvement as the right shuttler, often getting into key areas in the final third to link play. Like Mario Mandzukic, Muller has struggled to get involved in matches, and has often looked confused with his positioning, but there was a significant improvement against Monchengladbach. However, this was far from a blowout, and Lucien Favre’s men caused the Bavarian’s problems throughout the match. Max Kruse made constant runs into the channels to receive long balls and retain possession – and in the 30th minute, Kruse also forced Manuel Neuer into making a wonderful save. As influential as Kruse was, Patrick Herrmann was Favre’s key man, as Gladbach was determined to find the German winger on the right flank. 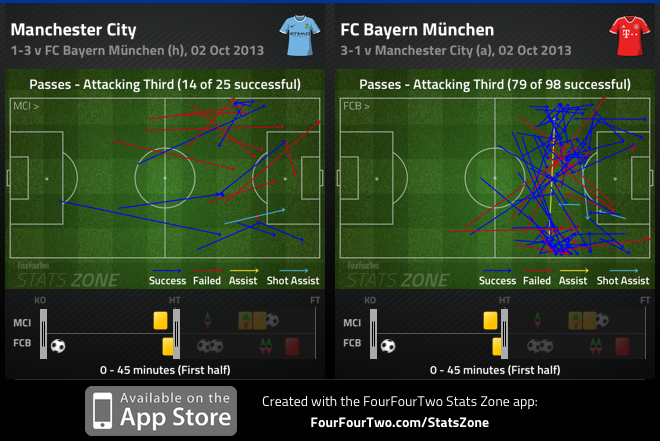 Of the few issues that Bayern suffered, one has been the positioning of their fullbacks. 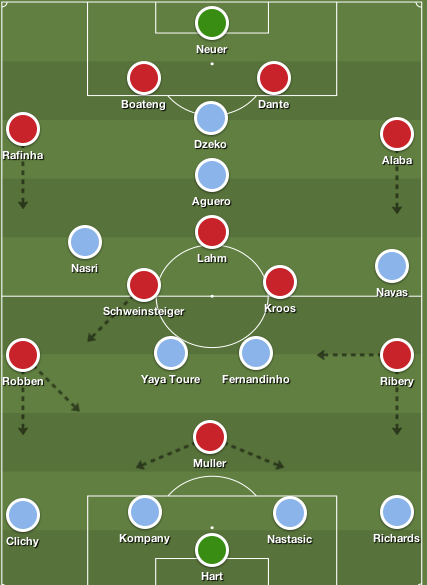 With the Bavarians aiming to press higher up the pitch, Phillip Lahm and David Alaba left a significant amount of space free behind them, which Favre’s men were keen on exposing. Juan Arango and Herrmann constantly got behind the Bayern fullbacks, creating chances for Kruse. One of the major changes Guardiola has made was the removal of the double pivot, thus playing with one holder in Schweinsteiger. The Bavarians encountered the same issue in the German Super Cup, and once again they were caught on the break numerous times. Favre’s men were unable to take their chances, saving Bayern from conceding more goals and possibly dropping points. Guardiola’s men put the game out of reach in the 69th minute, when Alvaro Dominguez conceded two penalties in the span of two minutes, allowing Alaba to convert his shot past Marc-Andre ter Stegen. Bayern start their title defence with three points, but Guardiola’s system will take a few more weeks to flourish – until then, it’ll be fascinating to see how the Bavarians evolve under their new manager. Pierre-Emerick Aubameyang’s life in Germany kicked off in fine fashion, as he became the sixth player in Bundesliga history to score a hat trick on his debut. Borussia Dortmund is out to make a statement this season and challenge for domestic honours, and Augsburg was their first victim, as they cruised to a 4-0 victory. Robert Lewandowski added the fourth goal with a thunderous penalty kick. “I pointed out to my team that our intensity would have to be the same as all other matches before, the Supercup included,” Klopp said. “Our opponents were extremely strong but in the second half we won the ball more and found more space. We scored great goals and finished the game with confidence,” he added. One area that Klopp will look to address is getting the best out of Ilkay Gundogan, who has played in the no.10 role and has failed to impress. But Aubameyang was the main man on the night displaying his aerial prowess, quality finishing, and ability to get behind the defence with his pace. Although Jurgen Klopp sold Mario Gotze to the Bavarians, the German manager looks to have assembled a side that’s potentially better then last season, with the inclusion of Aubameyang, Henrikh Mkhitaryan and Sokratis Papastathopoulos. Heung Min Son marked his Leverkusen debut with the match winner as Sami Hyypiä’s men easily dispatched of Freiburg at the BayArena. Last season’s Golden boot winner Stefan Kießling opened the scoring, but Mike Hanke leveled the match in the 40th minute, courtesy of a Jonathan Schmid assist. However, Leverkusen’s wide men had the biggest impact on the match, after both sides found the back of the net in a dull first half. Sidney Sam used his pace to make identical runs behind the Freiburg backline to assist Son’s winner and score Leverkusen’s third goal. Christian Streich’s men pushed for an equalizer but they struggled to create any opportunities in the final third. Frankly, most of their work came through Hanke, who was constantly moving across the final third linking play, but the creativity and final ball was lacking. Adam Szalai’s 72nd minute equalizer saved Jens Keller’s men from a disappointing opening day loss at the Veltins Arena. Klass-Jan Huntelaar once again caused the Hamburg backline trouble, scoring two goals, making it five in two games. But Schalke had other problems to deal with, starting with the 22nd minute departure of Julian Draxler, who limped off the pitch. Prior to his injury, Draxler was Schalke’s main attacking threat in the final third – spreading incisive passes in key areas, and assisting Huntelaar’s first goal. Yet, once he departed, Thorsten Fink’s men began to assert their dominance, exposing Schalke’s weakness in wide areas and aerial duels. Maximillian Beister got behind the Schalke defence on numerous occasions with his direct runs, and his 24th minute header gave Hamburg the lead. Meanwhile, Lars Sobiech out jumped Joel Matip in the second half to retake the lead, after Huntelaar leveled the game before half time. Matip and Benedikt Höwedes struggled in the air, and were unable to cope with Jacques Zoua’s intelligent movement, as they were constantly dragged out of position. Fink decided to switch to a 4-3-3 midway through the second half to preserve their lead, but it allowed youngsters Christian Clemens, Leon Goretzka and substitute Adam Szalai to stamp their authority on the match. They began to find gaps in the Hamburg midfield and looked threatening in the final third. More so, it was Clemens’ shot that Adler spilled and Szalai tapped in the rebound. We start by conceding three goals at home. That’s way too many. We weren’t in the game at all in the first half, but we did a lot right in the second half,” Keller said. Schalke fell behind twice, but found the courage to fight back, despite struggling for large portions of the match. Fink’s men were tactically superb, but the Hamburg manager’s decision to preserve their lead, led to their downfall, as the Royal Blues improved in the second half.